The brand new issue of Rhythm is on sale now and it features the greatest ever rhythm sections, as voted for by you! You voted in our droves over on Musicradar.com for your favourite drums and bass partnerships, and this month we count down the top 25 - did your favourite make the cut? Learn how to nail Paul Weller's 'Out of the Sinking', Young Guns' modern rock anthem 'Bones' and 'First It Giveth' by Queens of the Stone Age. Plus take all of your favourite lessons from Pete Riley, Jason Bowld, Erik Stams, Gareth Dylan Smith, Colin Woolway, Adam Bushell and Justin Scott. All this and more in the July issue of Rhythm available now from all good newsagents, online or digitally from the Google Play Store (Android). Pick up a copy from Apple Newsstand for iPad, iPhone and iTouch or on your Kindle Fire HD and you can enjoy video and audio tuition on your device plus bonus videos, image galleries and other content. 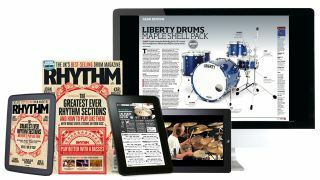 Head here to find out how you can buy Rhythm in print or our digital version.